Please tell us something about yourself: where and when were you born and places you lived. Where do you live now? I was born in Queens NY in 1982. I grew up in Rockland County New York. For those that don’t know, Rockland County is a suburban area of New York 40 miles from NYC. I moved to Hoboken New Jersey in 2005 following my senior year of College (S.U.N.Y Cortland). 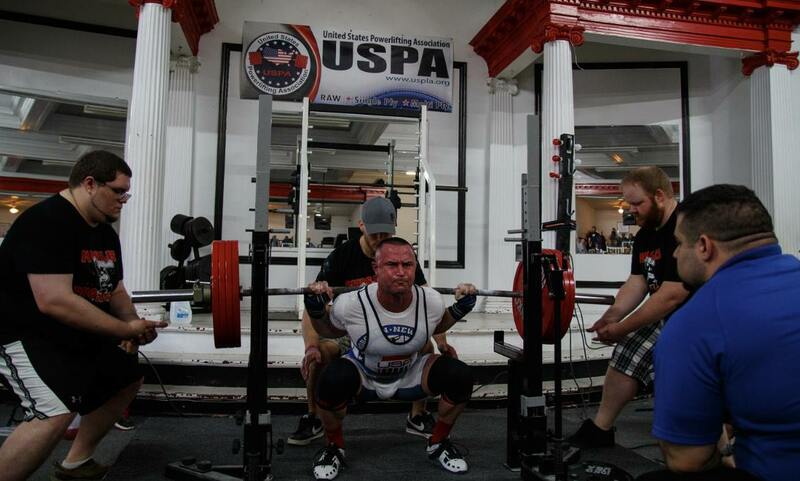 I opened Iron Arena Powerlifting & Performance in 2012. Iron Arena is located in Hoboken NJ, 7 blocks from my apartment. How would you describe yourself as a child? Very active? What types of activity interested you the most? Did you get involved with sports at an early age? Growing up, I put most of my energy into football and track and field. I may not have always been the best athlete on the teams that I was a part of but I was always the fastest. Speed and relative strength have always been two of the better qualities I have possessed in terms of athletics/sport performance. One of my earliest memories in regards to strength training was during gym glass in first grade. Part of the “Presidential Fitness Test” was to complete as many chin-ups as possible. Having never done them before I wound up doing 8. Bodyweight movements such as pull-ups, chin-ups, pushups always came easy to me. Perhaps I missed my calling in gymnastics. Then again there’s always cross-fit which I’d probably be doing if it weren’t for powerlifting. Were you involved in sports during Highschool? How was that experience? At that age, did you already entertain the idea of becoming professionally involved with sports/training? In high school I played football. I also ran track during both the indoor and outdoor seasons. I played running back and continued to do so my first year of college before deciding to focus all my efforts on Track & Field. It wasn’t until my senior year of high school that I decided I’d like to peruse something in the physical education, athletic training or the coaching field. I just didn’t know exactly what. During the next five years following graduation (from 2005-2010) I continued competing in track and field and even managed to set personal records in most of my events surpassing my times/distances from college. I believe this was do to my relentless obsession with figuring out ways to get better along with good old fashioned hard work. When and how did you decide to become a coach? Can you tell us a little about that choice and what it involved? Did your family support your decision? I began lifting weights in preparation for football when I was 13. I was always the first to arrive to the weight room and the last to leave. My work ethic has always been immeasurable. Over time that had become infectious as I found myself leading workouts in the weight room and being the go to guy in regards of “what to do”. I suppose that’s where my coaching journey began. I had always been a leader. During my junior and senior year of high school I’d spend my summers training with a few other sprinters in the area. We were entering summer track meets in preparation for the Empire State Game Trials in hopes to make it to the Empire State Games which I had attended numerous times. I wrote all of our workouts and we trained five days per week mid day in the middle of summer. Some days it was 90+degress and I’d imagine much hotter on the track. It was so hot our water would be too hot to drink and we’d spend our rest periods under a tree or near the bathrooms, which was the only place with shade. We’d sometimes train after 8pm but would have to find a stadium with lights. I had many people join me throughout the years. Some lasted only a few days. Those who stuck around saw their times improve significantly. My senior year was when the Internet became popular and with it came a plethora of information at my disposal via online forums which seemed much more convenient than reading through books and magazines for training information. It was then that I became interested in the Sport Sciences. Freshman year of college I decided to study Kinesiology with a concentration in Fitness Development. To take you through the years up to the point where I’m now would exceed the scope of this interview and would likely fill up pages upon pages. In regards to my family “supporting my decision” I ‘d say my mother was simply relieved that I actually got accepted to a school far away from home since I wasn’t the greatest high school student. I was the first in my family to graduate from college so for that I know my mother was proud. I’m convinced she really didn’t have a clue what my profession entailed until I actually opened my gym. She would go around telling people I was a “personal trainer”. With that being said, after visiting my facility and seeing videos and picture that I post on social media I think she now has a better idea. My uncle Gary Branfman has always been very supportive. We’re cut from the same cloth in the fact that he too cannot stand the thought of working for anyone but himself. He runs a very successful plastic surgery practice in Victoria Texas. Are you an athlete now? Tell us a little about your sports career, your achievements and your goals. Although I was never an elite/Olympic caliber runner/jumper my personal bests were quite competitive as a Division III athlete and as an open post collegiate sprinter. I finished my career with indoor personal bests of 6.63 (55m), 7.09 (60m), 22.37 (200m) 35.37 (300m), 49.93 (400m). Outdoors my best times/distances were 10.94 (100m), 21.98 (200m), 49.52 (400m) and 22’11.75 in the Long Jump. In 2010 I decided to give up track and put my return to football (I tried out for semi pro and practiced with a local team in preseason) on hold to focus exclusively on powerlifting. I had done a few bench only and push/pulls meets while in college and shortly after while I was actually still running track. I was already bench pressing 350 lbs. raw @158 lbs. at the time (USAPL/2008) and 385 lbs. in single ply gear at 161 (SSA/2007). In 2012 I suffered a shoulder injury that set me back 8 months. For the time being, since I couldn’t bench press I used this time to train my squat which had always been lagging due to the fact that I simply didn’t squat or train lower body at all when I ran track. I felt doing so had a negative affect on my recovery ability from my sprint work without providing any positive benefit. I did my first full power meet Dec 2012 where I totaled 1306 at 165 lbs. It wasn’t until January 2013 that I hit my first 400 lb. bench press at a bodyweight of 164 lbs. Since then I have competed 15 times (29 total since 2007) and my personal bests include a 523 lb. squat in just knee sleeves, 425 lb. bench press, and 562 lb. deadlift. My best total to date is 1488 and was done under drug-tested conditions. There are those who will commend me for being a drug free lifter and those who frown upon it for one reason or another. Before anyone passes judgment I would like state my position in regards to performance enhancing substances in the sport of powerlifting. 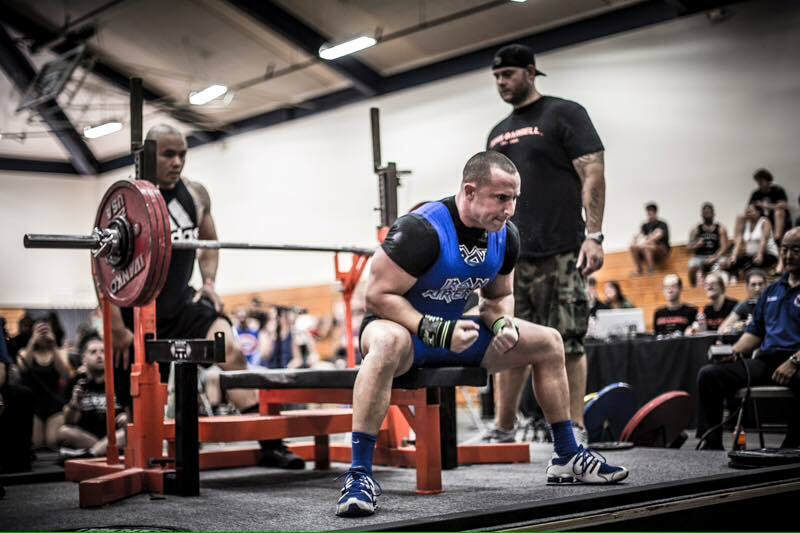 Increasing performance in the sport of powerlifting is a complex equation with numerous variables. As a former student of Exercise Science I enjoy the journey in improving athletic performance via manipulation of training variables without adding another “ingredient” with it’s own set of variables into an already complex equation.. I am not against the use of performance enhancing drugs. I feel they have value late in a lifters career (or at least for a better quality of life) when normal hormone levels begin to rapidly decline. What I am against is cheating (competing in a tested organization) when you are in fact not drug free. Also “USE” should not be confused with ABUSE. Now that that’s out of the way my short-term goal is to reclaim the All-Time Drug Tested American Single lift bench record that I set this past June (425 lbs.) and was broke three weeks later by Brandon Maddox with a 426 lb. lift. I’d also like to break the All-Time Drug Tested Full meet record of 418 lbs. while surpassing the 1500 lb. barrier in reference to 3 lift total. Long term I would like to exceed a 700 kg. total (1543 lbs.) before thinking about moving up a weight class. I’d suspect that might be another few years. What is your educational background? Do you think school provided you with good tools for the profession you chose? I earned my bachelor of science in Kinesiology from S.U.N.Y. Cortland in 2005. I feel that while the classes I took may have provided me with a “scientific backbone” to better understand the research I was doing there was very little practical application in regards to increasing sport performance. In addition to my degree in Kinesiology I am also a Certified Strength and Conditioning specialist thru the NSCA (National Strength and Conditioning Association). Although the NSCA is touted as one of the better certifications in our field I still feel they’re far from exceptional. I get into the reason why in one of the later questions. I am also a certified Level II Track and Field coach (USATF) in both the sprint and jump events. United States Track and Field offers a great program to obtain their certification. The USATF Level 2 Program is wrapped into an intense week-long course that includes three days of sport science lectures covering biomechanics, physiology, psychology and training theory. Coaches are separated into event specific groups which focus on the technical aspects of each event using video analysis, group projects, classroom instruction, and hands-on training. At the conclusion of the week coaches are tested on their knowledge from the event specific lectures and required to produce and present a yearly coaching plan to the other attendees and instructors. At what age did you start coaching at a professional level? How was that beginning (where, who helped you the most, what were your greatest challenges)? By professional level I’ll assume you mean when did I begin coaching as my prime source of income. This distinction needs to be made so that people aren’t getting a false impression that the powerlifting is a professional sport since that is the bulk of my clientele. Furthermore the track athletes I once coached were college level and although my general population clients are professionals in their respective occupation I’d never make the claim that I train professional athletes. Following college (I was 22 years old) I began working at Velocity Sports Performance. This was a dead end job since they expected us to operate like robots blindly following a book of cookie cutter programs. I felt my “coaching ability” was being wasted so after three months I accepted the job as the track and field sprints and jumps coach at Stevens Institute of Technology along with the assistant strength and conditioning job working with all other sports teams offered at the Division III University. To supplement my income I was also training general population at a commercial gym eight blocks from the university. I left Stevens after three years and developed a trainers education program at “Club H Fitness” (now “Crunch”) along with building my client base. I felt there was more money to be made in the commercial sector of fitness as opposed to coaching college athletics. Income may be the biggest challenge in this occupation. During the next 7 years I worked to develop a loyal client base that ultimately enabled me to open my own facility without much risk. If you feel comfortable, I’d like to know your thoughts about the educational background for coaches in your country: are the programs available adequate for your needs? What do you think makes a strong basis for coaching? How did you obtain this? Generally speaking, I feel the “educational background” for coaches in the USA is poor. From what I understand, our European counterparts have much better systems in place (ie. Schools of Physical Culture). It seems that the number of competent coaches pales in comparison to the number of incompetent coaches currently hired all the way from the developmental to professional sports levels. In many cases it seems that “who you know” is more important than “what you know”. The golden question: what is your approach to training (your “training philosophy”, meaning the way to organize exercises in a program, progression, principles to observe, whatever you think defines YOUR approach)? The fundamental principals of individualization and specificity have a large influence on my training methodologies. These two principles ultimately determine which modalities I use and how I manipulate certain variables to achieve individual’s specific goals. It’s also important to be able to distinguish between exercise and training with the later being what those that I work with partake in. The gap between science and practice: in your experience, how much does current scientific knowledge on exercise physiology, kinesiology, biomechanics, etc contribute to your daily decisions in coaching and how much does it fail to? While scientific literature should not be dismissed, it’s only one piece of the puzzle. Science often confirms what we have already figured out. I frequently see the same studies being repeated over and over. In many cases these studies include exercises being done incorrectly along with the subjects being chosen out of convenience. The subjects are typically college students participating in the study due to obligation. Those two variables alone are enough to make the majority of studies we’re reading pointless. I once participated in one of these studies while in college. After a night of partying myself and other members of the track team showed up to the exercise science lab on a Sunday morning for a study that dealt with foot position and force production during the sprint start. How reliable do you think this study was with a bunch of hungover and in some cases still drunk college seniors filling in as the subjects? What were your biggest challenges as a coach? My biggest challenge as a coach is making sure that “I’m not wanting it more than my athletes/clients”. You heard the old cliché “you can lead a horse to water but you can’t make him drink”. You can provide your lifters/clients with the best program to achieve their goals but if in the end they’re showing that they care less than you there is nothing you can say or do to change their mind. In that case your time is better spent with those dedicated to achieving greatness. Some professionals in the health care fields become so traumatized when making a bad call with a patient/client that they give up. Did you ever make a bad call? How did you handle that? What advice would you give to younger people starting their coaching career? I’m sure I’ve made bad calls but there are no specific ones that stand out to me for purposes of this interview. Attempt selection in powerlifting in something I have become very passionate about and I can recall a few bad attempts I’ve called. Simply learn from your mistakes is the best advice I can give. Try to also learn from the mistakes of others. How do you handle special groups, such as the elderly, pregnant women and the disabled? How is the communication with their primary health care professionals? Is it necessary and is it easy? What advice would you have for younger coaches when they are contacted by their first “special” client? Special groups are handled on a case-by-case basis. Due to liability it’s important that a waiver is signed including medical clearance. It’s your responsibility as a coach to do your homework and research the conditions/limitations of the individual(s) you will be working with. If uncertainty still exists, contacting their health care provider would be the next step. I’d advise others to do the same. What is your clientele today? (types of people and their needs) Do you have a preference for one or another type? 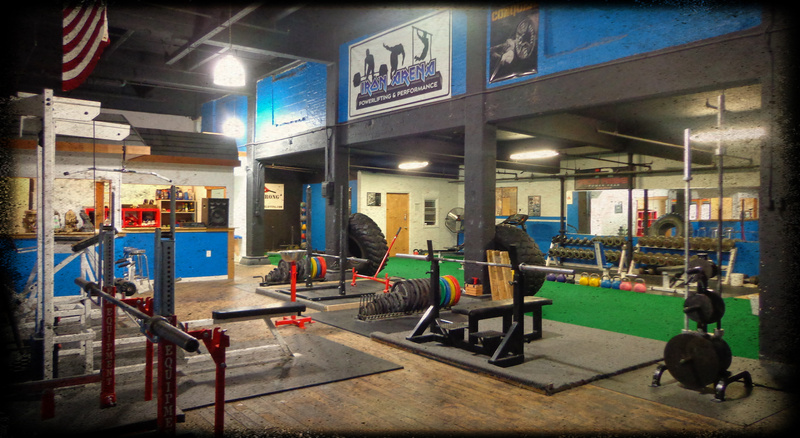 My gym (Iron Arena) is a private strength training facility as opposed to operating as a public gym. Membership is by invitation only. We offer Personal Training, Small Group Training, and Online Programming with access to the facility. Due to limited space The Online Training with Access Membership is reserved primarily to those competing in Powerlifting and other strength/power sports and those interested must go through a selection process via information obtained from a specific questionnaire. That said, I train both powerlifters and general population. Both groups have a common goal of becoming the best version of themselves that they could possibly be. My online clientele is 100% competitive powerlifters as that’s where my passion lies. Athletes: in which way are they different (or not) from other clients? While both my powerlifters and non-powerlifters (non athletes) all have particular goals that they would like to attain within a specific timeline there is very little room for procrastination/excuses for the athletes that will be called upon to compete in front of hundreds or even thousands of people on game day. When that day comes it’s “do or die” unlike those that want to simply lose 20 lbs. in “around 3 months” while getting “a little stronger”. If they spontaneously decide to go away for a few days, get sick or fall off track for a brief period of time it’s not the end of the world. The same does not apply for a powerlifter who is 8 weeks out from a large contest. Emotional / psychological aspects of coaching: if you had to instruct a group of young coaches, what would you say is the best professional attitude a coach must have concerning the emotional burden clients bring into the coach-client relationship? Besides a general approach, do you think some types of clients demand extra emotional work? Examples: anorexic young females, low self-esteem people in general, depressed or other psychiatric condition patients, over-stressed business people, etc. I prefer not to deal with those that must be “coddled” or “handled with care”. While I’d consider myself to be reasonable and somewhat understanding I’m aware that I’m not very compassionate so I try to not be someone that I’m not. While I can be a very loyal friend and have developed lifelong friendships with many of my clients I’m not a life counselor nor does the futon in my office resemble a psychologist’s couch. Each individual is different and it’s important that you tread carefully in your quest to find out how much you can push your clients before mental breakdown. You must also get to know them well enough to realize when they’re having a bad day and back off especially if you’re coaching style tends to be aggressive. Non-presencial coaching (online programming and/or coaching): what are the challenges? What to you require from clients to conduct a successful program? The challenges that are typically faced by coaches who do online programming can be kept to a minimum if the approach is process oriented. There must be a step-by-step process taking place from the second you as a coach are contacted by a potential client and throughout the entire coach athlete relationship. If you simply “wing it” you will be unable to provide the best service that you can to the lifter and your client retention rate will be poor. Before I begin with a new client I require that they fill out a very specific 38-question questionnaire and a waiver. I also ask for video of their 1RM’s in each of the 3 disciplines (Squat, Bench, Deadlift). These need to have been done within the past 14 days. If they’re not available they need to provide me with current videos. Upon receiving the information listed above (and receiving payment) I review their questionnaire and ask follow up questions if needed. From there, I develop a plan of action. Weekly training is sent via email (Excel spreadsheet) every Sunday evening. Upon conclusion of the week’s training, the spreadsheet is returned to me by Sunday afternoon including the achieved sets, reps, weights, RPEs, additional comments, and video when applicable. Training videos are sent via email or YouTube. This ongoing feedback is crucial for the athlete and coach as the following week’s training is developed based on this information. I am VERY methodical in my approach and take pride in my organizational skills and attention to detail. Because of this I can only train 25-30 lifters via online programming at a given time. You have your own facility. How did your training approach guide the construction of this training center (as in choice of equipment, special organization, etc)? 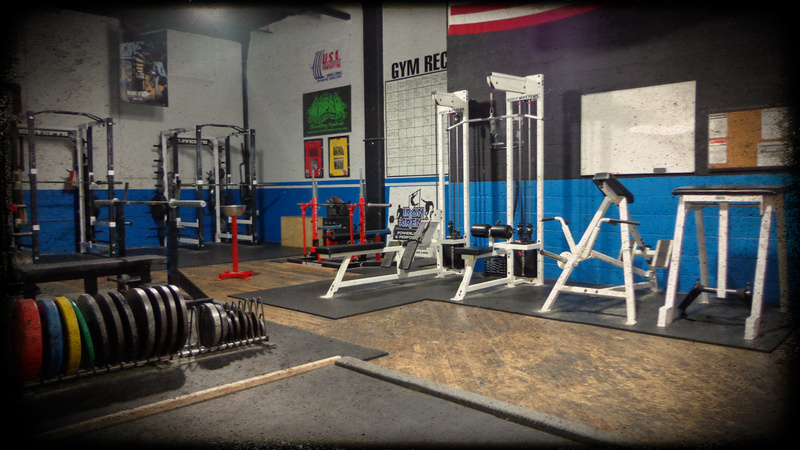 If you had to offer advice to someone opening their first gym (suppose a tight budget and not-so-tight), what would you say are the most important structural and organizational elements in such a place? My primary goal in first opening my training facility was to create training environment for my clients/lifters that is highly conducive to results. It needed to be equipped to meet the needs of powerlifters. That meant purchasing equipment identical to what will be on the platform regardless of which organization my lifters would be competing in. I’m a big fan of the manta “practice how you play”. On meet day there are a number of variables that can potentially have an adverse effect on your outcome if not kept in check so knowing that you’ve trained on the exact equipment you will be using in a meet is one less variable to worry about. Aside from that, I needed to make sure I had enough equipment to accommodate those that I am training in a group along with those that are not with me that particular day but are present in my facility training on their own. Over the past few years my business has grown to the point that I will moving hopefully sometime this fall to a larger facility which will allow me to accommodate more lifers. Advice I would offer to someone opening their first gym would be to buy whatever you need to satisfy the requirements of profit, based on the business model you have created.